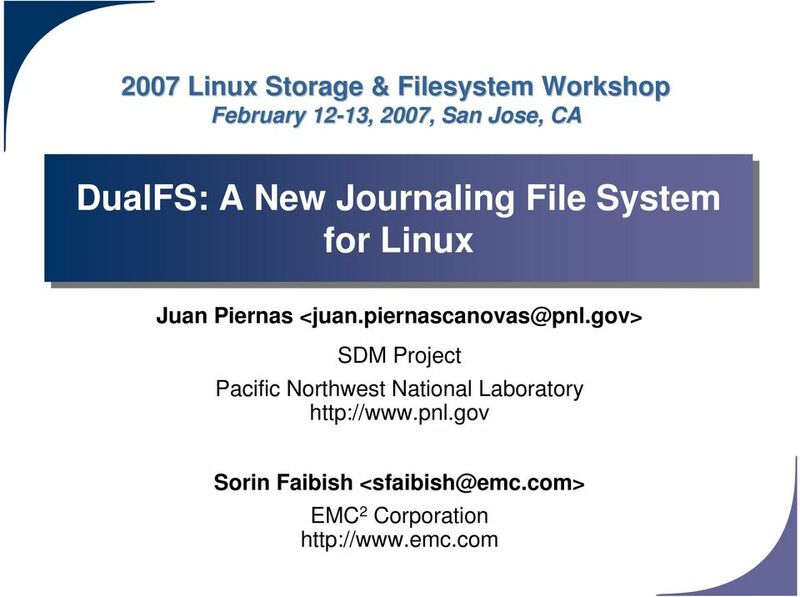 Download "DualFS: A New Journaling File System for Linux"
2 Introduction Meta-data management is a key design issue Especially important for recovery after a system crash Traditional file systems: Write meta-data in a synchronous way Use fsck-like tools Current approaches: Log of last meta-data updates (e.g. 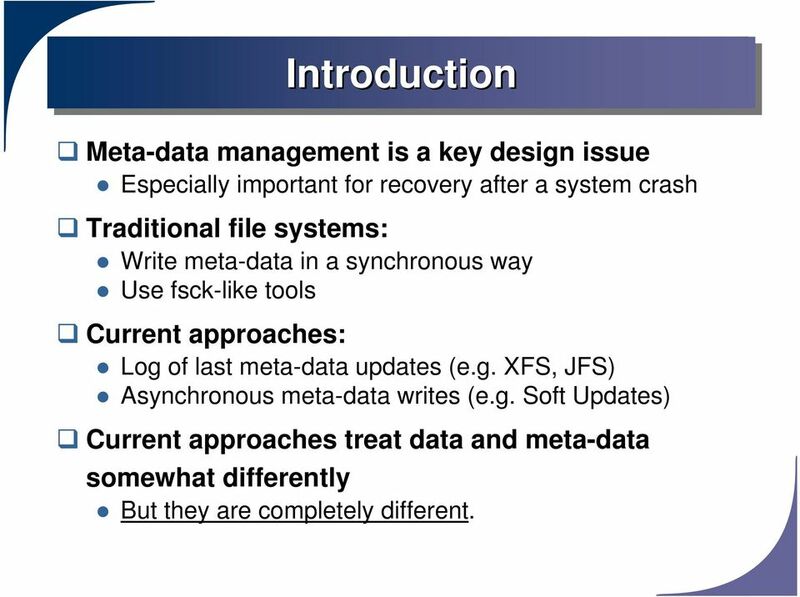 XFS, JFS) Asynchronous meta-data writes (e.g. 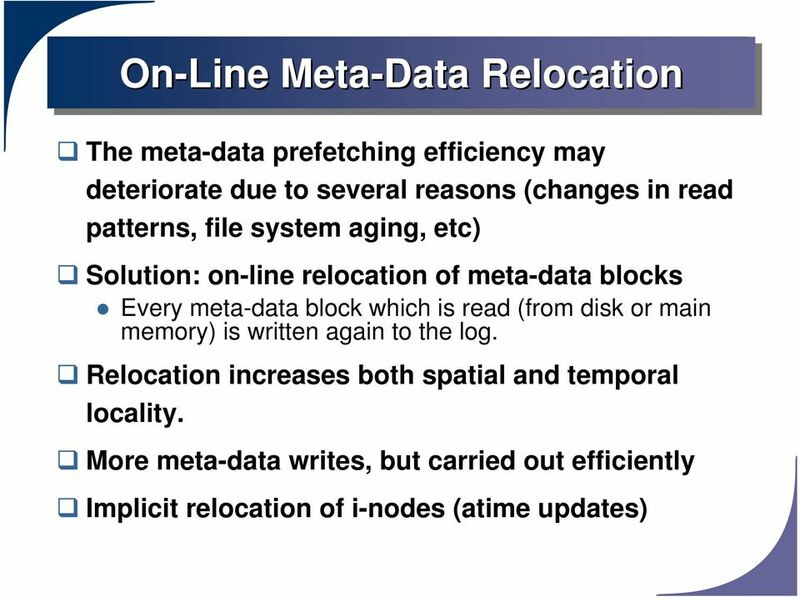 Soft Updates) Current approaches treat data and meta-data somewhat differently But they are completely different. 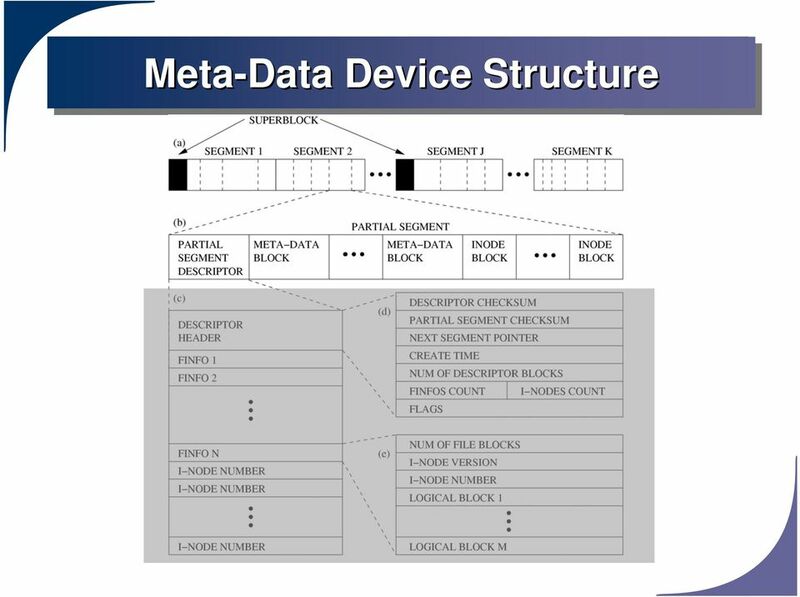 12 Meta-Data Device We understand meta-data as all these items: i-nodes, indirect blocks, directory data blocks, and symbolic links bitmaps, superblock copies Organized as a log-structured file system Similar structure to that of BSD-LFS. 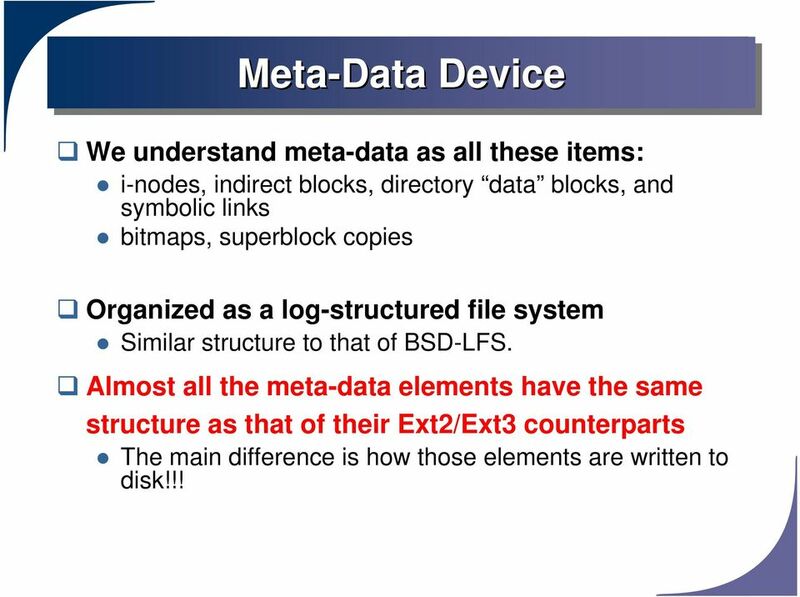 Almost all the meta-data elements have the same structure as that of their Ext2/Ext3 counterparts The main difference is how those elements are written to disk!!! 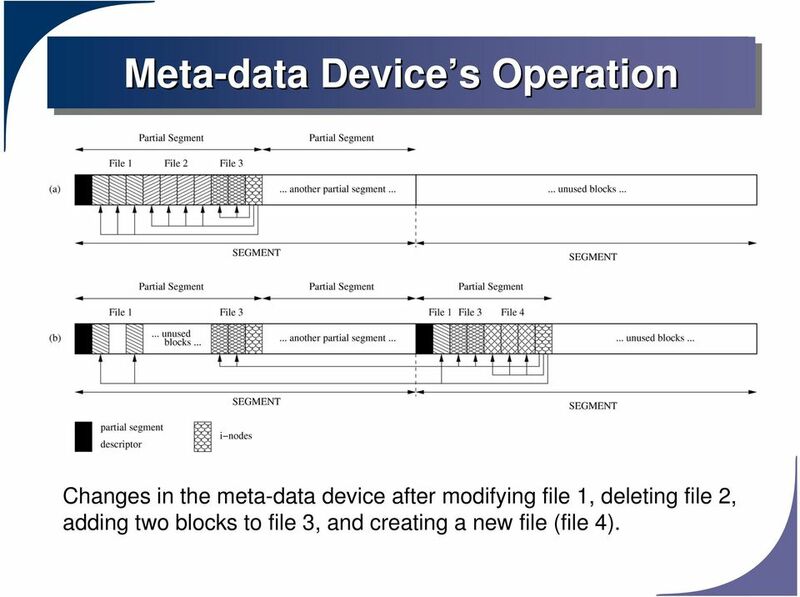 14 Meta-data Device s Operation Changes in the meta-data device after modifying file 1, deleting file 2, adding two blocks to file 3, and creating a new file (file 4). 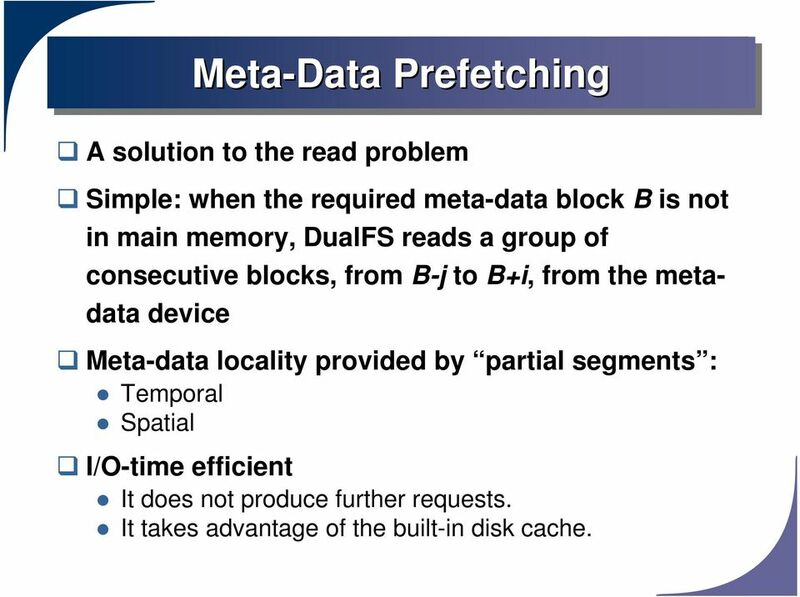 16 Meta-Data Prefetching A solution to the read problem Simple: when the required meta-data block B is not in main memory, DualFS reads a group of consecutive blocks, from B-j to B+i, from the metadata device Meta-data locality provided by partial segments : Temporal Spatial I/O-time efficient It does not produce further requests. It takes advantage of the built-in disk cache. 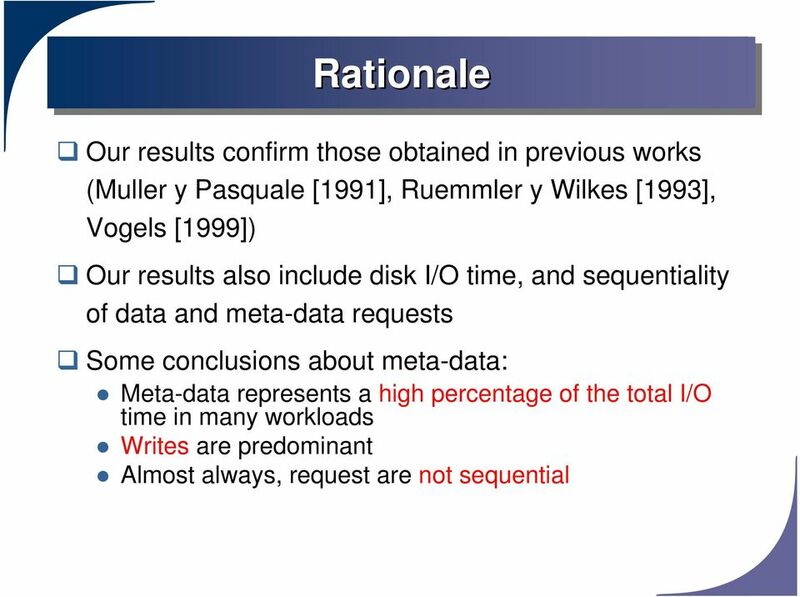 18 Recovery DualFS is considered consistent when information about meta-data is correct. 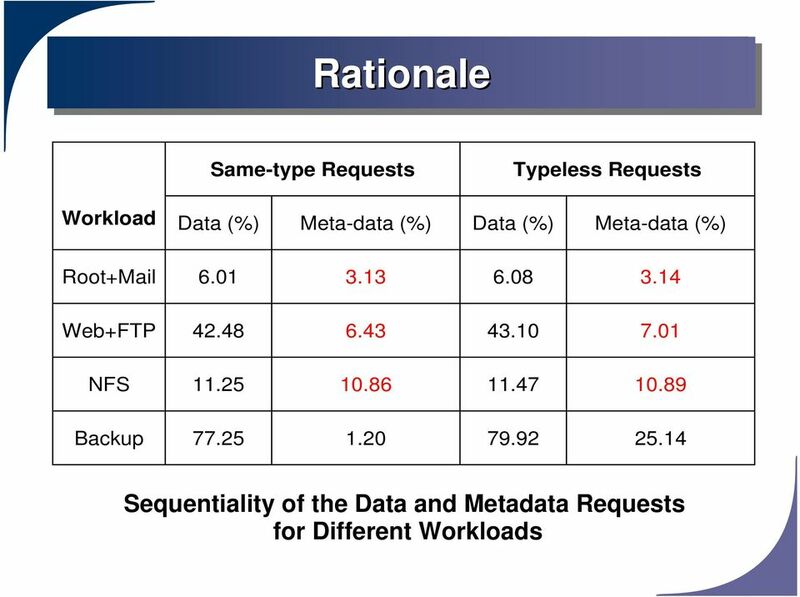 We can recover the file system consistency very quickly from the last checkpoint. The length of time for recovery is proportional to the intercheckpoint interval. 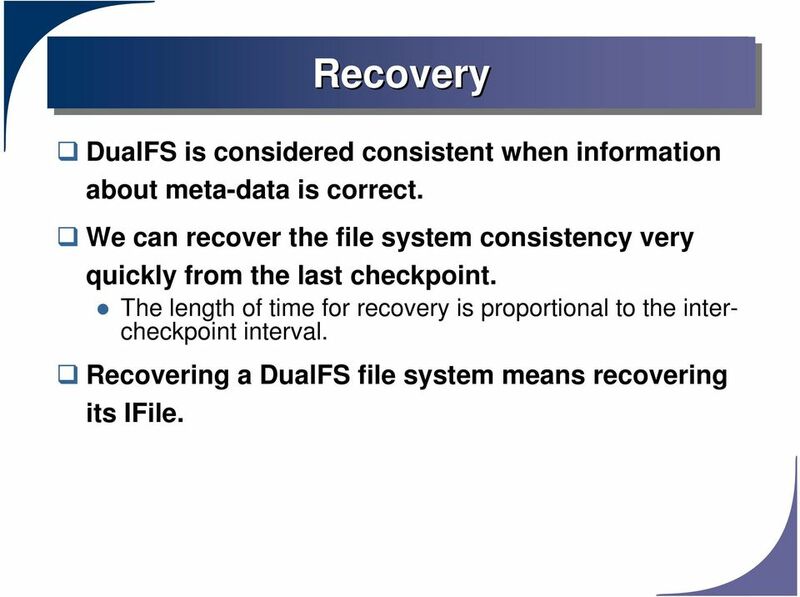 Recovering a DualFS file system means recovering its IFile. 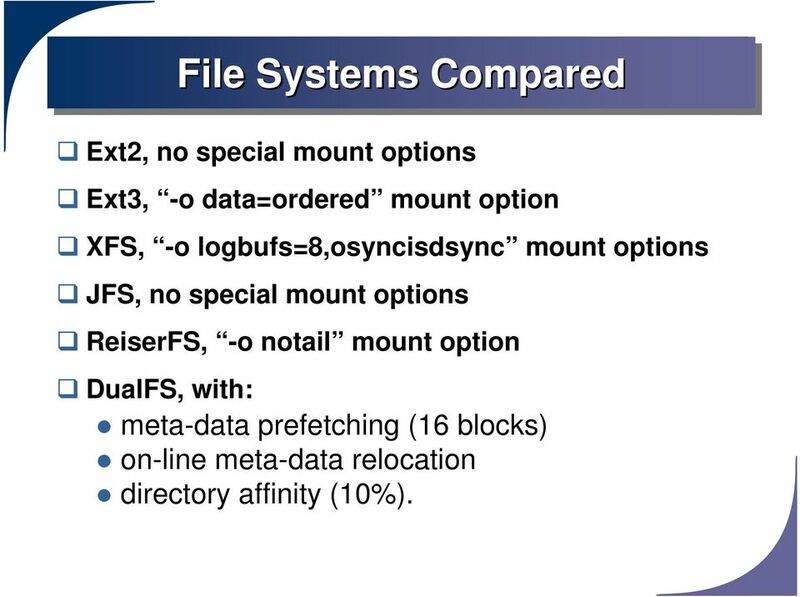 20 File Systems Compared Ext2, no special mount options Ext3, -o data=ordered mount option XFS, -o logbufs=8,osyncisdsync mount options JFS, no special mount options ReiserFS, -o notail mount option DualFS, with: meta-data prefetching (16 blocks) on-line meta-data relocation directory affinity (10%). 29 Macrobenchmarks Compilation of the Linux kernel , for 1 and 4 processes Specweb99 Postmark v1.5 TPC-C All but Postmark are CPU-bound in our system. 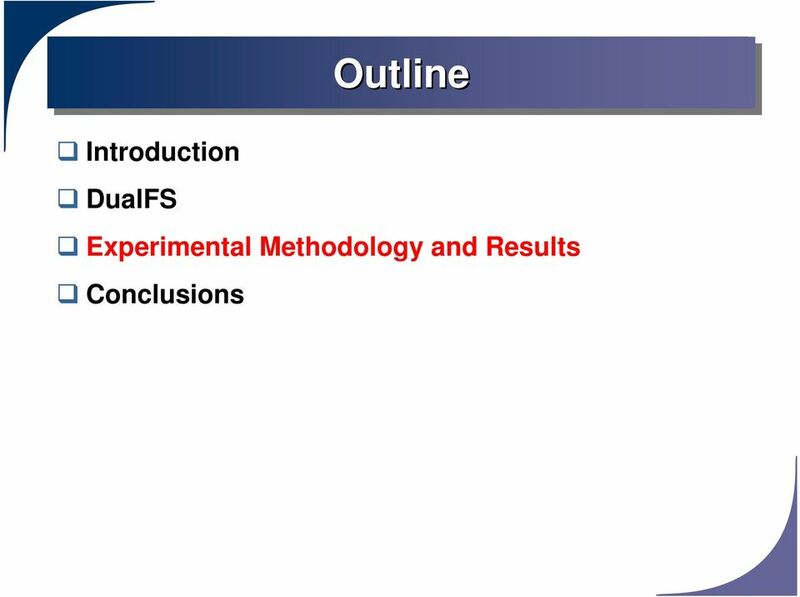 36 Future work To improve the design and the implementation: Deferred block allocation and extensions. 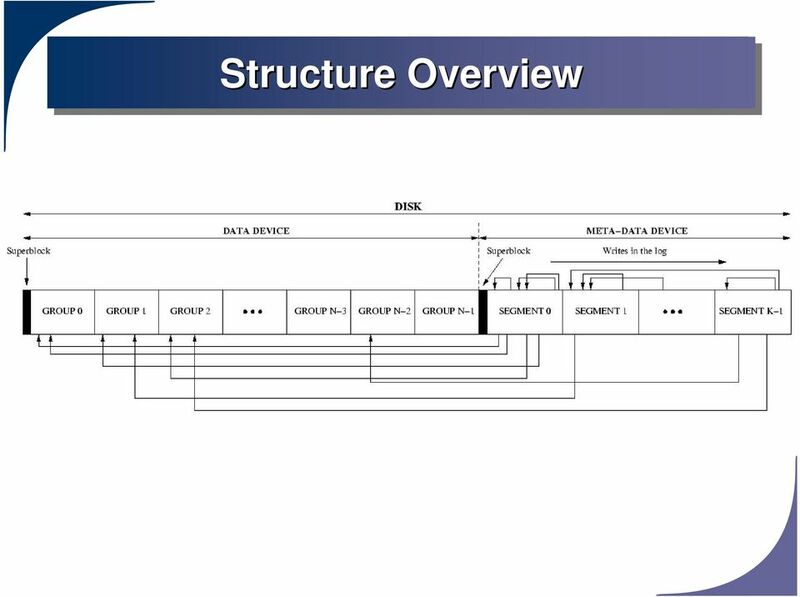 Better directory structure (B+ tree,.). 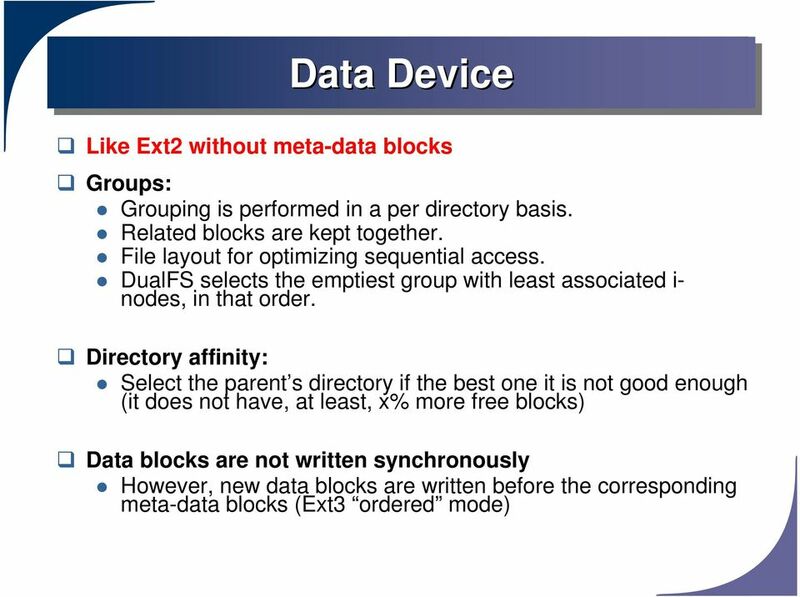 Data and meta-data devices in the same partition. Dealing with bad blocks. 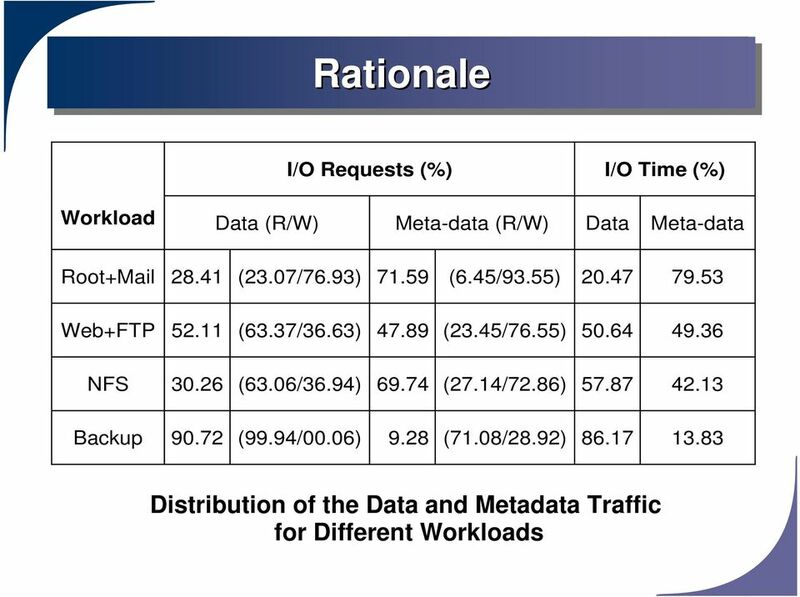 Meta-data device as generic LFS. 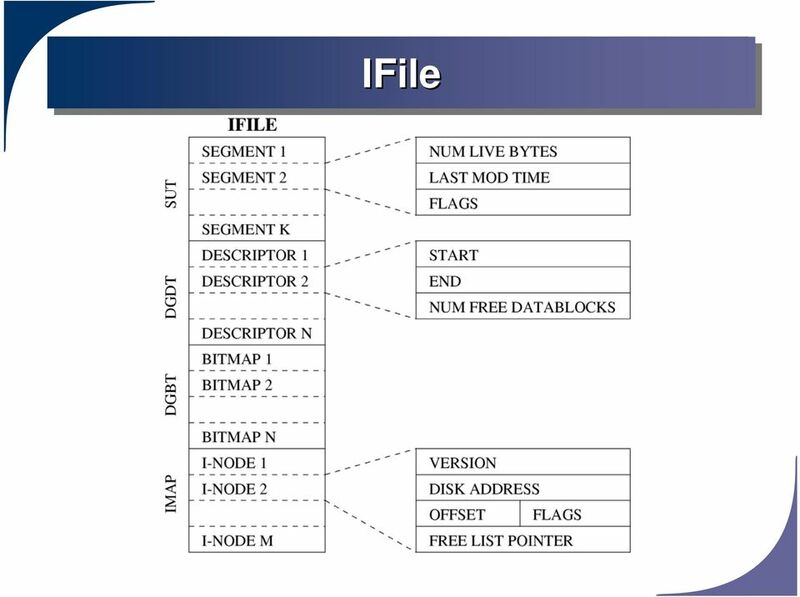 To explore new storage models: Object Storage Devices (OSD) To complete port to Linux 2.6.x: This can not be the effort of just one man. 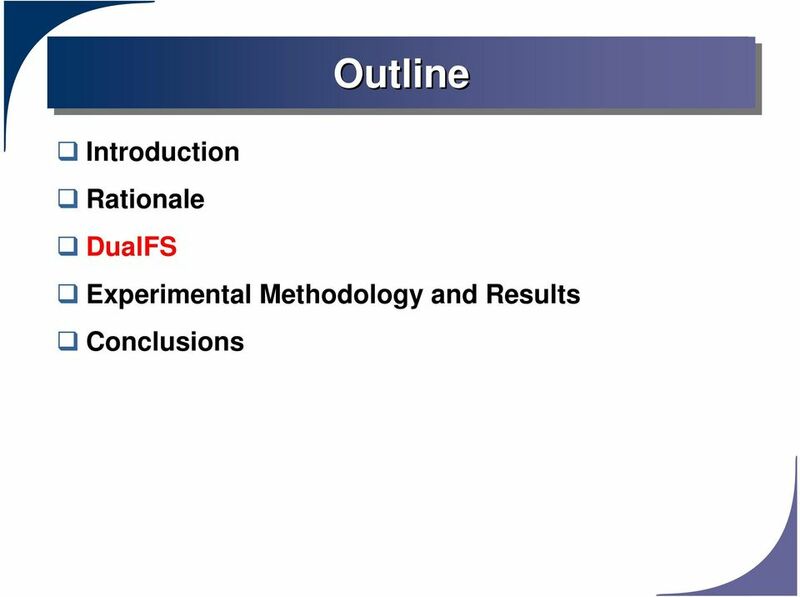 DualFS is an open-source project now!!! 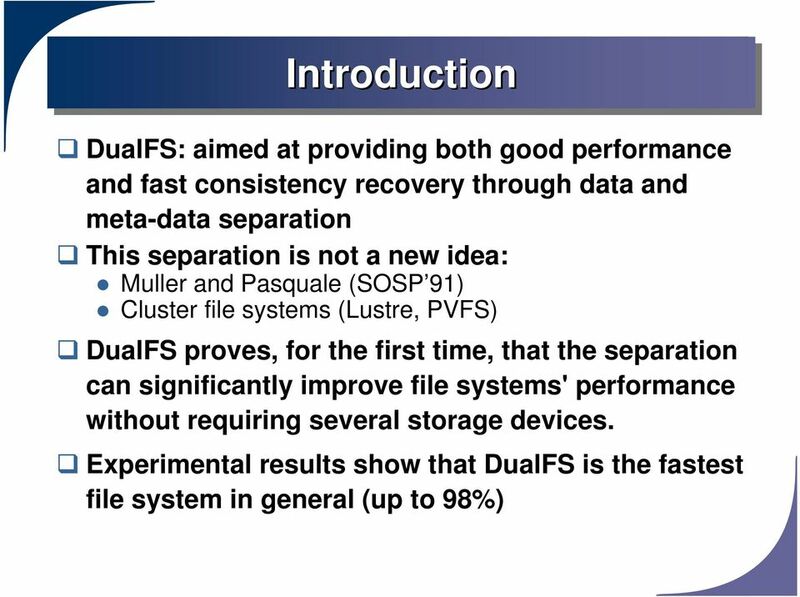 The Panasas Parallel Storage Cluster. Acknowledgement: Some of the material presented is under copyright by Panasas Inc.